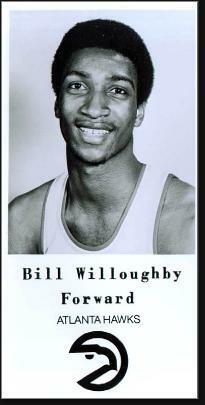 William Wesley Willoughby was born May 20, 1957 in Englewood. As a teenager, Bill’s talents made him a legend on the New Jersey hoops scene. He stood 6–8, weighed around 200 pounds and had vertical jump of 47 inches. Bill was a bright student but painfully shy. He attended Dwight Morrow High School in Englewood. He played center for the Raiders but he could handle the ball like a guard. He was practically unstoppable on the court, a player ahead of his time in many respects. After his senior season, Bill had an unusual choice to make for an 18-year-old. The University of Kentucky made him an appealing scholarship offer. On the other hand, an immediate paycheck beckoned from the NBA, where the Atlanta Hawks had selected him with the 19th pick in the draft. Leap-frogging college wasn’t exactly a new idea. A year earlier Moses Malone had signed with the ABA’s Utah Stars. And in the same draft, Darryl Dawkins had been taken by the 76ers. But these two players had strong, powerful bodies. Bill’s was long and lean, not yet ready for the 82-game pounding that awaited him in the pros. And he was playing a style of freelancing street ball that had been beaten out of his NBA peers by college and pro coaches. Bill chose the Hawks. He signed a five-year deal for $1.1 million. His age and paycheck made him a news story in every city the Hawks visited. It also made him a target for virtually every veteran in the NBA. His first coach, Cotton Fitzsimmons, took one look at Bill and moved him to small forward—a position with which he was completely unfamiliar. Competing for playing time with Connie Hawkins, Lou Hudson and John Drew, Bill played about 15 minutes most nights. It soon became clear that, for all his talent, Bill was a “project.” The Hawks traded him after two years, beginning and odyssey that would see him play in Buffalo, San Diego, Cleveland, Houston, San Antonio and New Jersey before his NBA days ended at age 26. A good night for Bill was 10 points and 5 rebounds. And there weren’t too many of those nights. The highlight of Bill’s career came during the 1981 playoffs. In a series against the Lakers, Bill timed a jump perfectly and swatted a Kareem Abdul Jabbar sky hook into the seats. After basketball, Bill retreated into a depression, living in his parents’ home and rarely venturing out. His basketball money was gone, siphoned off by unscrupulous business advisors. Starting in the mid-1990s, he watched as a steady stream of teenagers followed in his footsteps—some with great success and some without. But all had the advantage of having had the example of Bill Willoughby to consider. In 2001, Bill graduated with a degree in Communications from Fairleigh Dickinson University. It was part of a bargain he made with the NBA’s Retired Players Association. The league paid his tuition in return for his promise to act as a counselor to high school seniors considering a move to the pros. Today, Bill lives in Hackensack.